Comic artist, caricatyrist and graphic designer Tarmo Koivisto (born in 1948) is a household name in Finland. Koivisto graduated from University of Arts and Design in Helsinki in 1974 and has been rewared the coveted Puupäähattu Award in 1978, the state Arts and Design Prize in 1992 and several other comics and literary honours. His main work Mämmilä ran between 1976 and 1996 without interruption first in Me-lehti magazine and then in the monthly supplement issues of Finland’s biggest newspaper, Helsingin Sanomat. In the fictitious small town Mämmilä the changes in society throughout the years – the comings and goings of fads, the rises and falls of in the economy and the slow erosion of the small town life by modernization – are reflected in miniature form in the everyday stories of its residents. 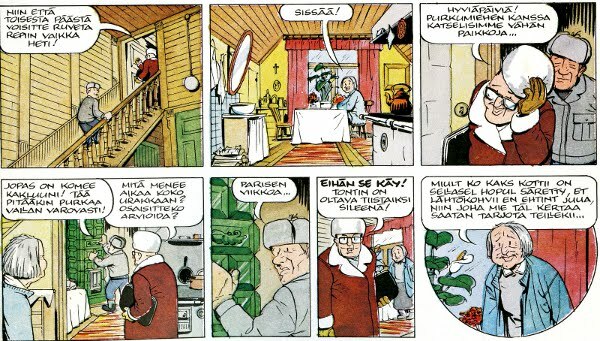 In the 1970’s, at a time when comics were still mostly viewed as formulaic light entertainment, Mämmilä proved that the medium was a valid tool for expressing complex issues by depicting daily Finnish life in an accessible, true-to-life, and humorous way. Koivisto has followed his success with the serial Pääkaupunki, which began its run in the Helsingin Sanomat monthly supplements in 1997. In addition to this, he has illustrated books and held comics workshops in Africa and India with the aim of doing aid work through comics. A related book called Comics with an Attitude was published in 2007 both in print and web form (available free of charge here).